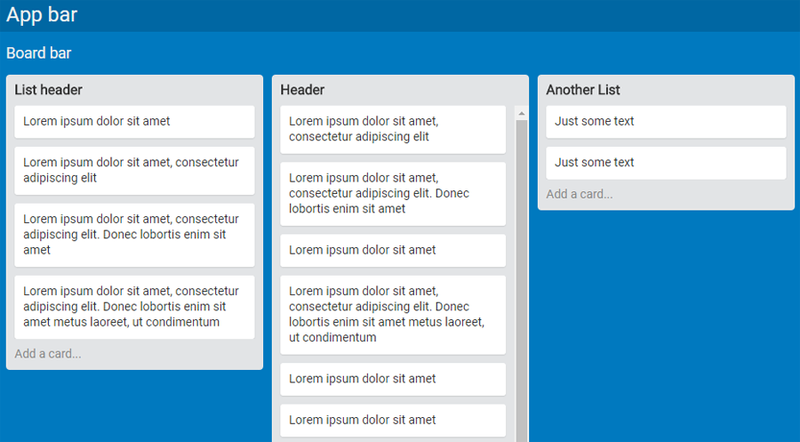 In this tutorial, I’ll walk you through an implementation of the basic layout of a Trello board screen (see example here). This is a responsive, CSS-only solution, and only the structural features of the layout will be developed. For a preview, here is a CodePen demo of the final result. Besides Grid Layout and Flexbox, the solution employs calc and viewport units. To make the code more readable and efficient, I’ll also take advantage of Sass variables. No fallbacks are provided, so make sure to run the code in a supporting browser. Without further ado, let’s dive in, developing the screen components one by one. This layout will be achieved with a CSS Grid. Specifically, a 3×1 grid (that is, one column and three rows). The first row will be for the app bar, the second for the board bar, and the third for the .lists element. Viewport units ensure that the .ui container will always be as tall as the browser’s viewport. A grid formatting context is assigned to the container, and the grid rows and columns specified above are defined. To be more precise, only the rows are defined because there is no need to declare the unique column. The sizing of the rows is done with a couple of Sass variables for the height of the bars and the fr unit to make the height of the .lists element span the rest of the available viewport height. Assigning the auto value to the overflow-x property tells the browser to display a horizontal scrollbar at the bottom of the screen when the lists don’t fit in the width provided by the viewport. The flex shorthand property is used on the flex items to make the lists rigid. The auto value for flex-basis (used in the shorthand) instructs the layout engine to read the size from the .list element’s width property, and the zero values for flex-grow and flex-shrink prevent the alteration of this width. Next I’ll need to add a horizontal separation between the lists. 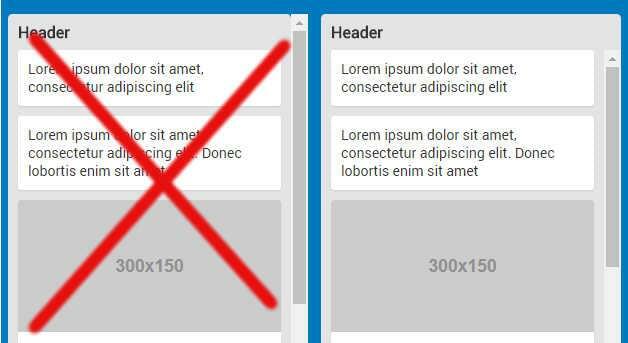 If a right margin on the lists is set, then the margin after the last list in a board with horizontal overflowing is not rendered. To fix this, the lists are separated by a left margin and the space between the last list and the right viewport edge is handled by adding an ::after pseudo-element to each .lists element. The default flex-shrink: 1 must be overridden otherwise the pseudo-element ‘absorbs’ all the negative space and it vanishes. Note that on Firefox < 54 an explicit width: 100% on .lists is needed to ensure the correct layout rendering. The crucial task here is how to manage the height of a list. The header and footer have fixed heights (not necessarily equal). Then there are a variable number of cards, each one with a variable amount of content. So the list grows and shrinks vertically as cards are added or removed. But the height cannot grow indefinitely, it needs to have an upper limit that depends on the height of the .lists element. Once this limit is reached, I want a vertical scrollbar to appear to allow access to the cards that overflow the list. This way, since .list is always as high as .lists, regardless of its content, its background-color property cannot be used for the list background color, but it is possible to use its children (header, footer, cards) for this purpose. A further $scrollbar-thickness amount is subtracted to prevent the list from touching the .list element’s horizontal scrollbar. In fact, on Chrome this scrollbar ‘grows’ inside the .lists box. That is, the 100% value refers to the height of .lists, scrollbar included. On Firefox instead, the scrollbar is ‘appended’ outside the .lists height, i.e, the 100% refers to the height of .lists not including the scrollbar. So this subtraction would not be necessary. As a result, when the scrollbar is visible, on Firefox the visual space between the bottom border of a list that has reached its maximum height and the top of the scrollbar is slightly larger. As mentioned, the list background color is rendered by assigning the $list-bg-color value to the background-color property of each .list element’s children. overflow-y shows the cards scrollbar only when needed. Finally, some simple styling is added to the header and the footer. The third positive margin value takes care of the space between the cover image and the card text. Finally, I’ve added a flex formatting context to the two bars that occupy the first rows of the screen layout. But they are only sketched. Feel free to build your own implementation of this by expanding on the demo. This is only one possible way to accomplish this design and it would be interesting to see other approaches. Also, it would be nice to finalize the layout, for instance completing the two screen bars. Another potential enhancement could be the implementation of custom scrollbars for the card lists. So, feel free to fork the demo and post a link in the discussion below.